Sunday Eucharist is at 9:30 a.m. In the Episcopal Church, all who are Baptized are welcome to share in Communion. Coffee and Fellowship follows the Service in the Parish Hall. ‘ALL’ are welcome to attend. Please look under ‘About Us’ – ‘Services and Worship’ for Holy Week Services and all other special services. Open Chapel Thursday’s Looking for a quiet place for prayer, reflection, meditation or study? 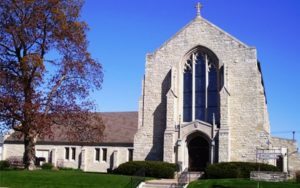 The Chapel is Open from 9:30 to Noon every Thursday from May through October. Please feel free to visit. All are welcome. Our Mission: Welcoming, Worshiping, Serving, and Growing Together in Christ Our Lord!